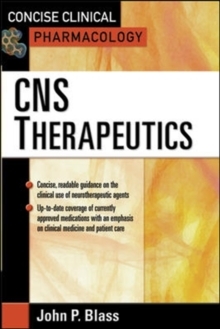 This title offers a concise, one-stop coverage of CNS Therapeutics. Written from the perspective of real-world patient care, this resource delivers expert guidance to the clinical pharmacology of modern CNS (Central Nervous System) medicines. It details what drug to use, when to use it, and how it metabolizes and interacts. It is organized according to both therapeutic agent and clinical disorder. It also includes Patient Safety information on common pitfalls and errors in prescribing.